Nighthawks is a 1978 British film by Ron Peck and Paul Hallam. Hugely controversial upon its release, it charts the day-to-day existence of Jim (Ken Robertson), a young-ish geography teacher living in Notting Hill, London. A gay man, Jim spends many of his evenings in the city’s few gay bars and discos, frequently managing to find someone to come home with him. His relationships rarely last more than a few days or weeks, however, and Jim seems doomed to continue a cycle of rather unsatisfying pseudo-connections. The one relationship he has which seems (on occasion) to transcend the banality of his brief romances is the platonic one he starts with Judy (Rachel Nicholas James), a new supply teacher at his school. Whilst Jim and Judy seem initially stuck in the niceties of lower middle-class English conversation, they progress in the course of the film to interactions which briefly reveal their comparable sense of loneliness and frustration. Judy — married and a mother of two — is as limited by the ideological constraints of alienating, family-orientated capitalist relationality as is Jim, for all the putative freedom of his gayness. 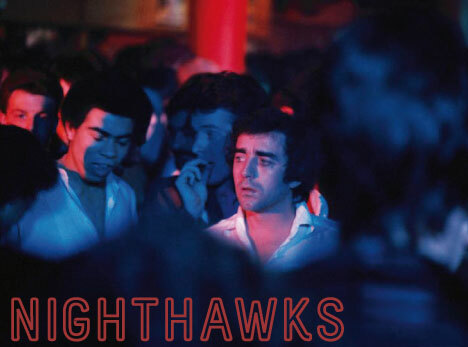 Nighthawks remains an incredibly powerful and deeply politicized cinematic experience, capturing late 1970s London with a sharp eye that anticipates only too well the the fact that Thatcher’s Britain lay just around the corner. This entry was posted in Previous screenings. Bookmark the permalink.